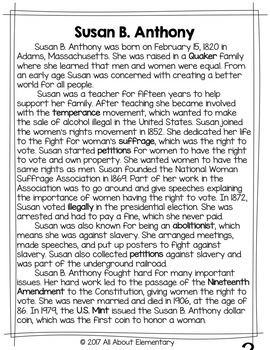 This is a four day unit on Susan B. Anthony. 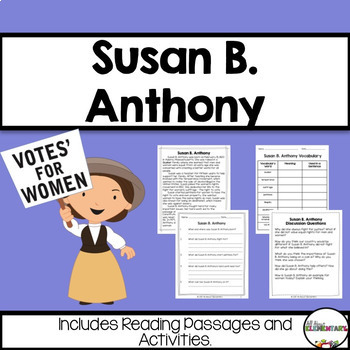 It contains a reading passage about Susan B. Anthony's life at two different levels. There are a variety of activities included for students to complete with the reading passage. The activities give students the opportunity to work with the reading passage multiple days, so they gain comprehension and become more fluent readers. 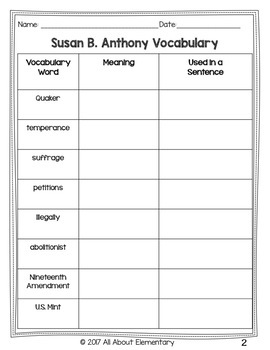 It also includes discussion questions so students can talk about the importance of Susan B. Anthony on U.S. history! This unit is part of my Women's History Bundle! Leave feedback to earn points towards future TPT purchases. Follow me to be notified of new products.